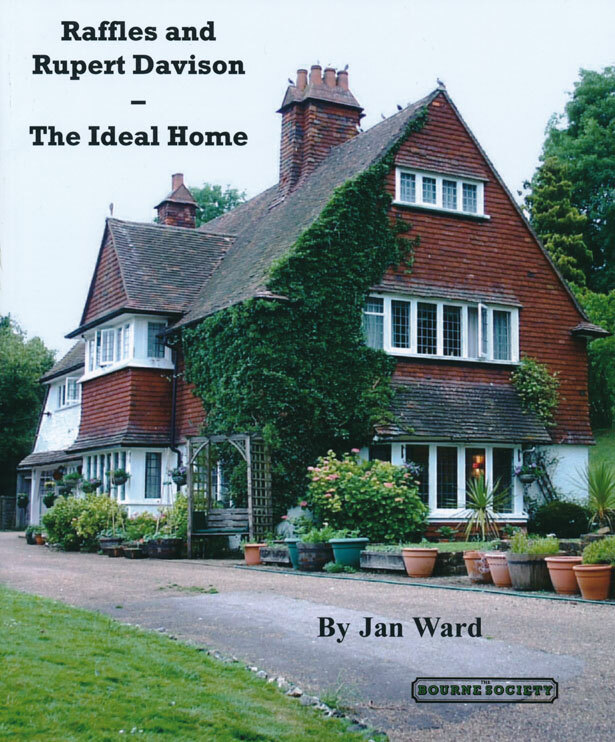 In this sumptuous new publication from the Bourne Society, Jan Ward traces the life and work of the architects (Thomas) Raffles Davison (1854-1937) and his son (William) Rupert Davison (1881-1917) who together were instrumental in portraying and promoting the notion of the ‘Ideal Home’. Spurred on by events like the introduction of the Daily Mail Ideal Home Exhibition, the Davison family bridged the gap between the extremes of plain functionality and the necessity for artistically appealing exterior and interior design. About 1890 the Davison family moved to Woldingham where Raffles remained until his death in 1937, and Rupert until his death on the Western Front in 1917. As well as being influential throughout the UK, they were responsible for the design of numerous residences in Woldingham and the surrounding area, all of which are featured in this book. Jan Ward’s study is a lavishly illustrated, 123-page large format book containing 125 photographs (fifty of them in colour), line drawings, sketches, plans, views and portraits. Very useful bibliographies of architectural references and other sources are provided. In addition to its obvious contribution to local history, the book will be essential reading for students of domestic architecture in general. Published in June 2016, it is now available from the Bourne Society at a price of £11.00 (see the ‘Society Shop’ page). If ordering by post in the UK, please add £3.00 for post and packing.